The University of Pretoria’s Resilient Africa Network (RAN) Southern Africa Resilience Innovation Lab (SA RILab) based at the Department of Research and Innovation Support Graduate Centre supports students to identify, develop and nurture innovations transforming them into viable businesses for building resilience in African communities. Such efforts support the University’s community outreach programmes that help bridge the gap between university scholarship and community knowledge. Through such support, Moses Kebalepile, a PhD in Public Health student and Elijah Djan an Engineering student, at the University of Pretoria won first prizes in the Innovation Hub’s Gauteng Accelerator Programme (GAP) competition. The Innovation Hub ran four high profile innovation competitions for Gauteng-based researchers and entrepreneurs in the Green, Medical, ICT, and Biotech sectors. Moses Kebalepile’s Asthma grid project won first place in the GAP Medical category and was awarded a total of R350, 000 (R200,000.00 seed award and R150,000.00 incubation award) and Elijah Djan’s Nubrix project won first place in the GAP Green category and was awarded R200, 000 in seed funding and incubation services. They will receive incubation services with technical and business mentors, intellectual property lawyers and will access the Innovation Hub’s network of industry and government partners. 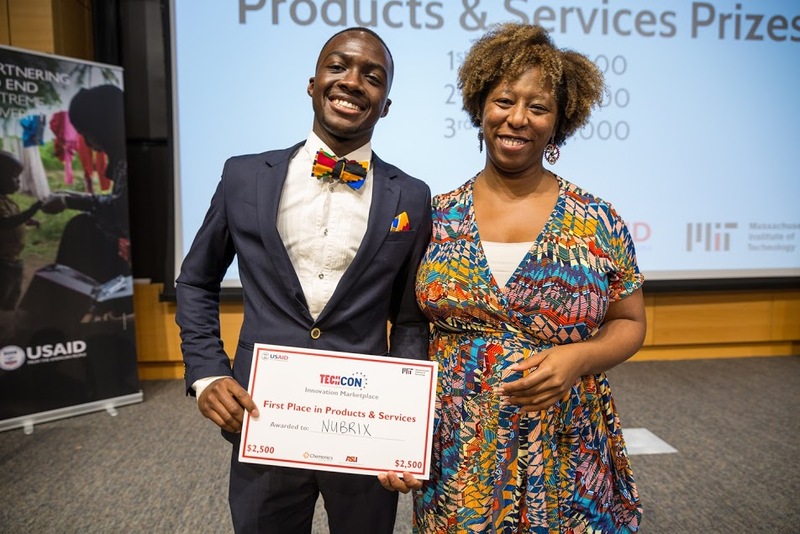 In addition, during the interactive Innovation Marketplace at the USAID’s Higher Education Solutions Network (HESN) technical convening TechCon 2016 in Massachusetts Institute of Technology (MIT), Boston USA, November 10-12, 2016, Elijah Djan, working on the Nubrix project-‘re-cycling paper to produce bricks’, walked away with the 1st prize worth USD 2,500. The SA RILab continues to work with students in higher education institutions to provide support in identifying, developing and nurturing innovations with potential to change the lives of many communities burdened by the high incidence of diseases and food insecurity in the Southern African region. Details about the SA RILab can accessed at: http://sarilab.ranlab.org/. Details about TechCon2016 are accessible here https://www.usaid.gov/news-information/press-releases/nov-7-2016-usaid-and-mit-host-techcon-2016. Details about the HESN Labs is accessible here https://www.usaid.gov/hesn/about.